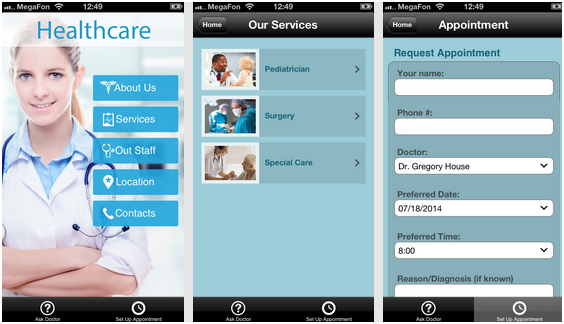 It’s not always easy building up a client base for a doctors office with mobile app. You really just want to do what you do best, treat patients, but there is this little area that requires you to either dump money on or put in the legwork yourself. That area is marketing, and doctors hate it. In the digital and mobile age, you have a unique chance to sell your services without putting in much work at all. Not to mention you don’t have to take out ads that make you look like a used car salesman. Simply start an app using one of the prebuilt mobile app templates for doctors, and you can start connecting with people no matter where they are. Why? Because each message or update goes to a phone that is sitting right in your clients’ pockets. Let’s take a look at some ways to market your doctor’s office by using a simple mobile app. Every once in a while doctors offer special rates or specials for particular procedures, making it particularly enticing for customers to come in. With a mobile app you have a unique chance to send out push notifications that alert people whenever one of these specials is available. Simply create the push notification in iBuildApp and send it out for the world to see Doctors Office with Mobile App. You can even setup a GPS based push notification that reminds people that they should come in for a checkup when they walk or drive bear your office. The appointment page is a crucial way for doctors to make it easier for patients to schedule appointments and even cancel without having to call the office and speak to a person. This not only cuts down on the time you and your employees spend chatting on the phone, but it offers patients a way to connect with you quickly. This is one of the rather easy ways to market your practice through a mobile app since you can simply tell people to download the app and schedule an appointment whenever they want. Doctors realize that not every person who strolls through their office booked a time three weeks in advance. Sometimes a patient has an emergency so they must go to your office while driving home from work or while walking nearby to a Doctors Office with Mobile App. The only way to grab these last-minute patients is to offer a mobile app that features a map to look for directions. Patients bring up the location, search for directions and they are well on their way to your office without you thinking about the whole process of explaining directions on the phone. Patients enjoy free information from their doctors, so why not include a news feed in your mobile app that reveals the most recent trending articles in your field? In your mobile app they can click on the News tab and see if a recent medical study came out or if there is a particular drug that is being recalled. This goes along with offering great content such as news feeds, but it adds a more customized and personal twist. When you upload videos and how-to guides on your mobile app you create a line of trust that extends to customers who might need some simple help with their health problems without going to the doctor’s office. Share your thoughts on our article Doctors Office with Mobile App in the comments section below. Let us know if you need more ways to market your doctor’s office, and explain what techniques you have used to find more clients who could use your services.